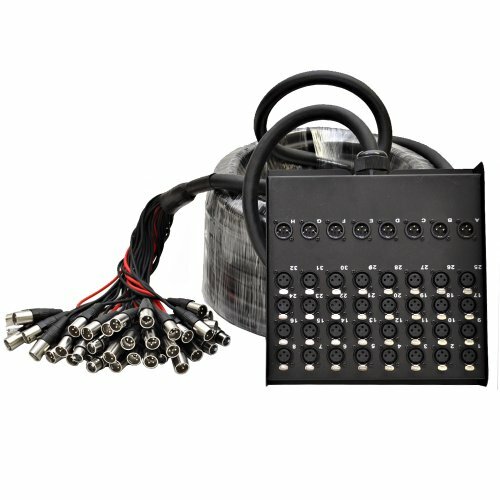 32 Channel XLR Low Profile Circuit Board Snake Cable -100 Feet - Model #: SACB-32x8x100, Sends: 32 XLR Male Connectors, Returns: 8 XLR Female Connectors, Length: 100 Feet, Weight: 42 lbs., Condition: NEW, Stage Box is numerically labeled, Stage Box Dimensions: 10.75 L x 10.25" W x 2.75" D, Circuit Board Technology within the Box, Fantail is color coded and numerically labeled, 100% individually shielded pairs, 25 gauge heavy duty conductors, Heavy duty steel stage box with handle, High quality XLR connectors at both ends, One Year Warranty. Whether you have a permanent installation or mobile, this snake cable is rugged enough to handle whatever you throw at it - road ready and built to last. With circuit board technology you are insuring a solid connection with your connectors. The quality of your sound can only be as good as the connections between the stage and the mixer and with this snake cable, each pair of heavy duty conductors is individually shielded, yielding crystal clear sound while rejecting extraneous noise. XLR connectors on the returns make this snake cable fit right in with professional power amps and mixing consoles without the need for converters or couplers. Awesome quality snake cables are very hard to find, especially at a decent price. The Seismic Audio brand was designed to make the professional musician, as well as the musician low on cash, sound great. With your purchase, you will receive one audio snake cable pictured and described above. So, put it in your cart today and get ready for years of trouble-free, crystal clear sound!